I have a new online class on Annie's Creative Studio -- Peachy Keen! This was a difficult secret to keep because I absolutely fell in love with the quilt! 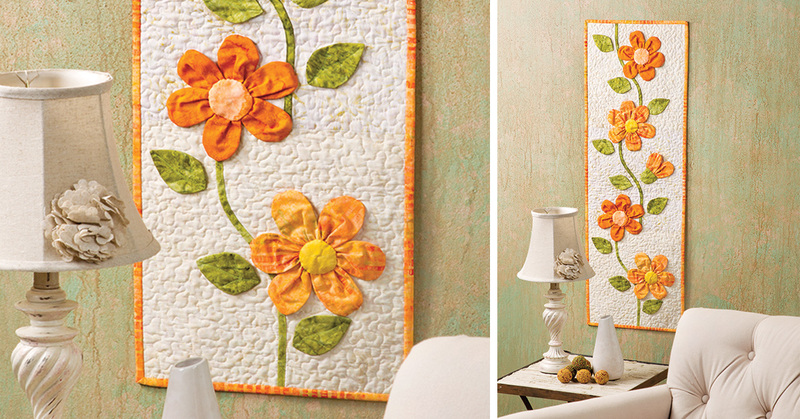 Three simple blocks and dimensional applique stems, leaves and flowers are all it takes to create the gorgeous Peachy Keen Wall Hanging. In this Learn, Make, Create! episode, quilting expert Debby Brown will demonstrate a quick way to make bias strips, how to make the dimensional flowers and tips to meander your background machine quilting so that it flows from one block to the next. You'll learn two methods to prepare templates for the flowers and leaves. To add the pattern to your Annie's Creative Studio pattern library or to download it to your personal device, click on the Patterns tab. I made a sample in flat cotton and filmed while making another sample using Sew Batik fabrics. I was not a fan of batik fabrics until I tried stitching with Sew Batik fabrics. They have converted me 100%! Filming for Annie's Creative Studio is a lot of fun because they give you the pattern and I get to show you how to make the project. What could be better? "It could be better if it was free?" you say? Well...… You can sign up for a free 30 day trial at Annie's Creative Studio and take this class for (you asked for it) FREE! This week's Splendid Sampler block is Milk and Cookies by Rebecca Bryan. Oh, the things that I could say about cookies. I tried to make the quilting look a bit like a cookie. How did I do? Are you making blocks from The Splendid Sampler 2? How would you quilt this block? This week's block from Amanda Herring's Friendship Quilt Along is Gracious. I am writing this post from a hotel room in Long Island, NY while teaching at Pieceful Quilting. Next week I hope to be caught up with all of my blocks and to show you my progress. I am thoroughly honored to be a part of The Splendid Sampler 2! The book is available for pre-order, but Pat and Jane are releasing a block every week up until the release. The first block is Quilt Market by Alex Veronelli. I borrowed Kitty Wilkin's block to show how I would quilt it. I had to quilt this block with ribbon candy because, in my not-so-humble opinion, it is the world's most perfect machine quilting pattern. Too much ribbon candy, however, can be a bad thing. This block divides itself into sections of three strips. I alternated quilting ribbon candy in one strip and lines in the next one throughout the block so the quilting didn't become muddled. Are you following along with The Splendid Sampler 2? What fabrics will you use to make this quilt? I'm so excited that today is my day on the Florabunda blog hop! When I received my fabric, I fell in love! I knew I wanted to use this fabric in my A La Mode Cutie Pattern and I showcased it against black fabric. And here's my finished quilt! This probably looks like a bold choice of thread to use on black fabric, but I know from experience that this thread blends into black really, really well. Like "impossible to photograph" well. Have you fallen in love with Florabunda yet? Would you like to make this 48"x48" A La Mode Cutie Quilt using Florabunda fabric? If you wonder how you would machine quilt this quilt, you don't have to wonder for long. My new video class will teach you how. It's not quite ready yet, but you can join my mailing list to stay in-the-know about all of my upcoming classes. Yes, I said classes, PLURAL!!! Thanks for stopping by to see my Florabunda quilt. Be sure to check in on all of the other blog hoppers! 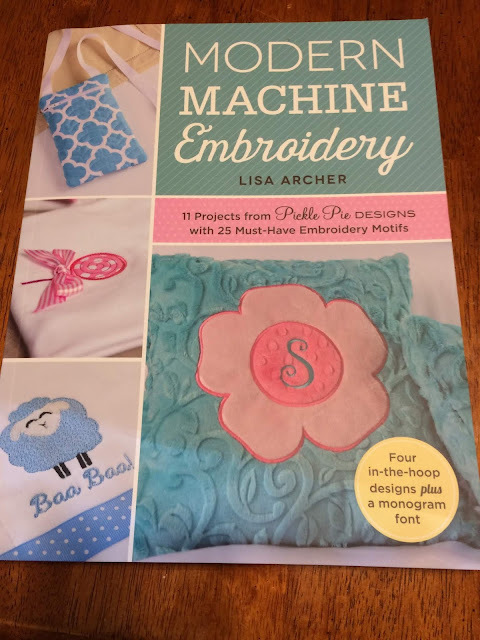 Last week, I shared a challenge that Lisa Archer from Pickle Pie Designs issued -- dust off my embroidery machine and USE IT! I found her Modern Machine Embroidery book on my bookshelf and transferred the designs from the CD to my computer and then to a drive for my embroidery machine. Now I'm dreaming of what to do with them. What would you do with two lonely little redwork apples? I am continually trying to clean my sewing room. When I installed my design wall, I packed up all of my thread in boxes. 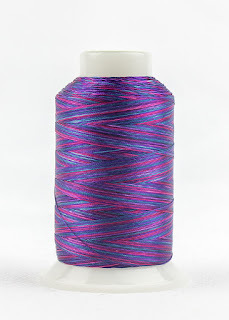 I put all of my embroidery thread into a single container... AND LOST IT! So, an hour later, I found the embroidery thread hiding in an AQS tote bag from 2010 on the bottom shelf of my book case. I finished my Sweet Tooth Cutie Quilt! Just look at the texture the ribbon candy quilting adds to the quilt! After the machine quilting comes the binding. This was a most-hated chore for me before two things. This quilt is done, it was all made with scraps from my sewing room, and my sewing room doesn't look any emptier. I have to make another scrap quilt from my 1 1/2" scrap bucket. Any suggestions? The Florabunda Blog Hop starts today! Florabunda + Cutie Pattern = deliciously lovely quilt! While waiting to see my finished quilt, follow along with all of the other designers HERE. This is my twelfth year with Handi Quilter, but Handi Quilter is 20 years old this year and I feel like celebrating! Here's to another great 20 years, Handi Quilter!!! I'm stitching together a scrappy Sweet Tooth Cutie Quilt and I have fallen in love with it. I have noticed one thing about scrap quilts, however, that I don't love: they require a lot of grooming! I snip away the extra threads as I'm quilting and always amazed at how full my snip jar is at the end of the process!!! Do you have extra grooming to do on your scrap quilts? Do you have any tips to share? The first block of Amanda Herring's Friendship Quilt Along is FUN! No, seriously, the name of the block is Fun! 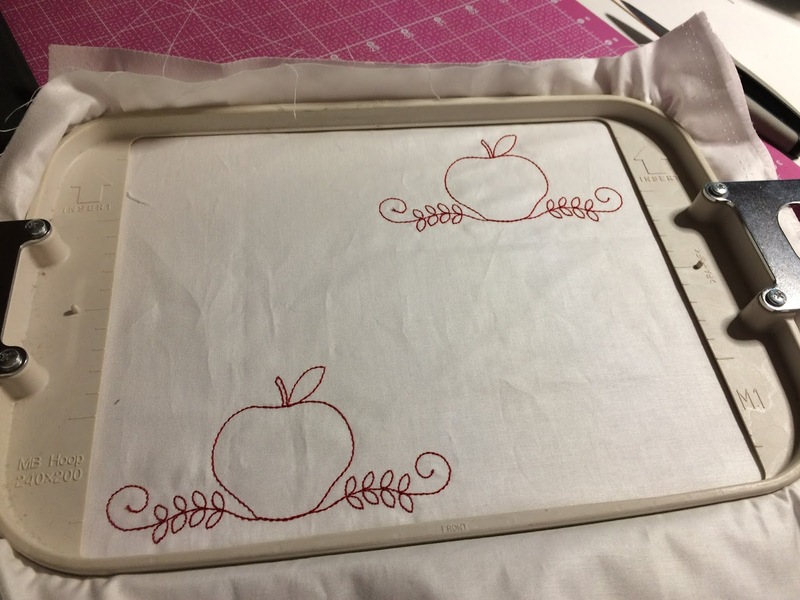 Instead of using Amanda's gorgeous Hello Lovely fabrics, I chose to use very muted colors and patterns so that the machine quilting will show better. I definitely need to make a Cutie Quilt (or three) from this fabric line, though, because it is totally darling! I used Amanda's templates to prepare my freezer paper hand-applique shapes. This first block was a test to see if my not-so-nimble fingers could once again applique... and THEY CAN! This project brought much comfort while I was recovering from my last infusion treatment. They work and I'm terribly grateful for them, but they aren't the most fun things to endure. I don't have another treatment until after this entire project is completed. Hurray for a completed project and no treatments!!! I applique using straw needles and InvisiFil thread. 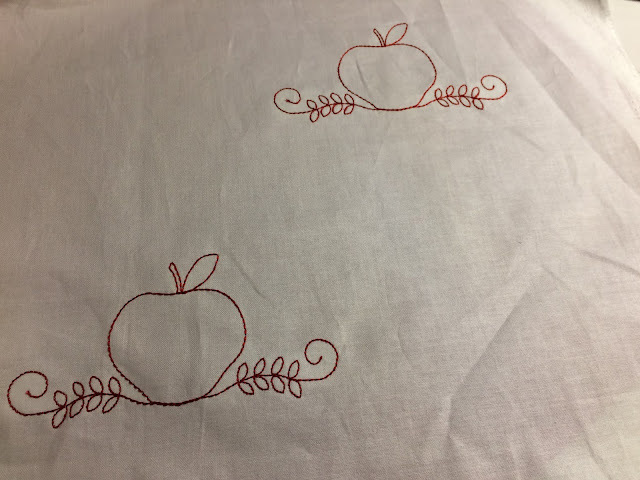 I find the longer straw needles easier to grip and the 100 weight polyester InvisiFil thread disappears into the quilt for a nearly invisible applique stitch. How perfect is that??? Instead of waiting until the entire quilt is assembled to show you how I would quilt this block, I want to give you some quilting inspiration as we go. Check on all of the Fun blocks on the internet today in blogs and on Facebook and Instagram!